Celebrate Cook Play Live’s Healthy Eating and Cooking NYC Impact on June 13 at 6:00 pm! Sip a glass of red or white wine or beer. Nibble on hors d’oeuvres inspired by seasonal produce from Our Harvest. Learn about lives and communities we’ve touched. Discover what we’re up to next! Leave knowing you've done good for an evening. 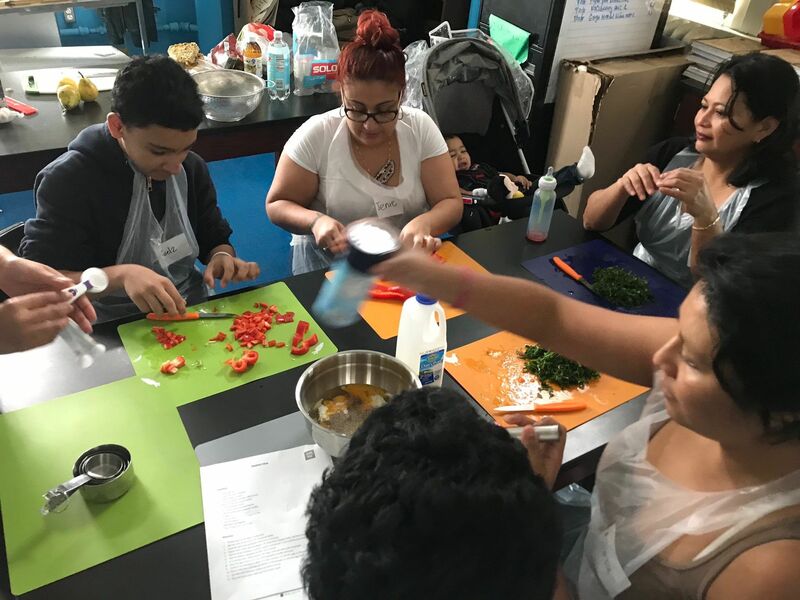 Cook Play Live is an NYC-focused organization that empowers children, youth and adults in low-income communities to eat healthier by improving nutrition knowledge and cooking skills with affordable recipes that reflect NYC’s cultural diversity. The event will help us raise critical funds to support our programs for the coming year. With your continued backing, we are excited to be able to continue our existing partnership with New Settlement Apartments at PS 294 and PS 311 and deepen our new alliances with Mount Eden Children’s Academy and Creative Leaders After School Program. Together we shall inspire even more New Yorkers to embrace healthy eating choices and the joy of cooking. Our goal is to raise $8,500 to cover the upcoming year’s programs. With your generous support, we're confident we shall reach that goal. A special thanks to our sponsors: Our Harvest and Suburban Wines! · Donating online: Just $55 allows one child to participate in six Cook Play Live healthy cooking and eating sessions! $260 provides groceries for twenty-five children to cook and eat healthily six times! Your generous contributions, through ticket purchases, donations, or silent auction participation, are greatly appreciated. Cook Play Live is a non-profit corporation recognized by the IRS under section 501(c)(3). Your donations, in excess of the cost of goods and services received, will be tax deductible. $175 buys groceries for 25 children to cook and eat healthy FOUR times! YOU get a wonderful evening of wine, beer, non-alcoholic drinks and appetizers with people who care about New Yorkers and healthy eating! $110 means TWO children each get SIX Cook Play Live healthy cooking and eating sessions! YOU get a wonderful evening of wine, beer, non-alcoholic drinks and appetizers with people who care about New Yorkers and healthy eating! $55 means ONE child gets SIX Cook Play Live healthy cooking and eating sessions! YOU get a wonderful evening of wine, beer, non-alcoholic drinks and appetizers with people who care about New Yorkers and healthy eating! Show your support early. Be the first ones to get a ticket and help us spread the word! Cook Play Live Inc has partnered with Give Lively to securely process your online donation. This transaction will appear on your credit card statement as "Cook Play Live Inc". This transaction is subject to Give Lively's Terms and Privacy.